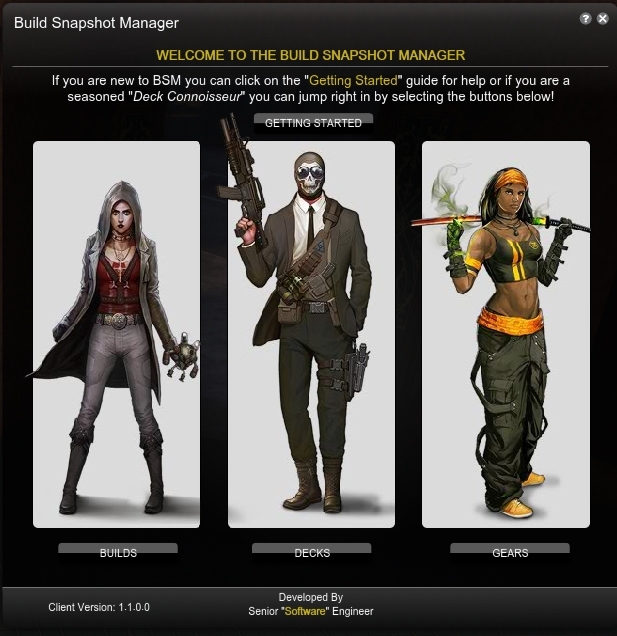 One of the unique traits of The Secret World is the support to mix and match various abilities from the skill wheel to create one of a kind characters. Trying to manage your unique combination of abilities and gear can become a daunting task. Being able to quickly switch out your characters layout while the rest of your group patiently waits for you is another story entirely. 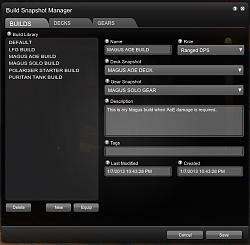 The Build Snapshot Manager makes managing your abilities and gear a snap! 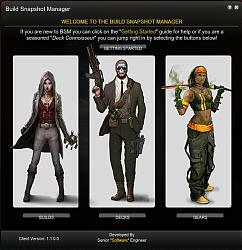 With BSM players can create an unlimited number of builds and switch between them with a single click of the mouse. 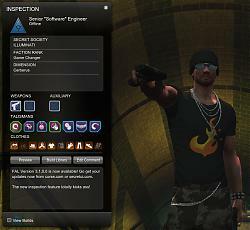 Visit the BSM website For more information, release notes, bug reports and player feedback. The Gear tab is truncating my set name. This has been fixed. All names support 50 characters. Please try again. The name (no quotes), "NM Ele/Shotgun Manifests 12345 67" displays fine. The name (no quotes), "NM Ele/Shotgun Manifests 12345678" does not (12345678 is truncated off). They both contain 33 characters. This does display fine, "NM Ele/Shotgun Manifests .cleanup." My guess is that some characters take more width than others and so the left side lists truncate based on their width and so won't display 50 characters; they would need to be wider or use a different font to get more characters in the same space. 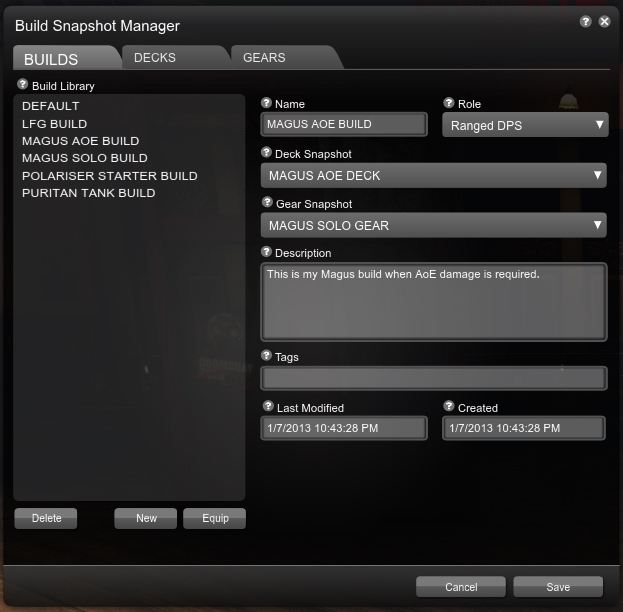 The only feature that I would request myself; I tend to change the overall workings of a build, deck, gear, etc. I'd like to be able to save it all at once like the original gear manager was intending. 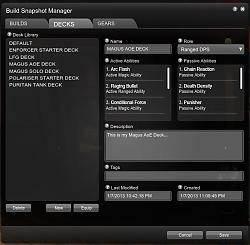 Is there any way to add another button to the 'build' portion of the snapshot manager that saves the currently related deck and gear settings as well as the menu portions of the build? I wouldn't want to do it every time, but it'd be nice to have for when I do wish to. Thanks, and sorry to harass. Im working something like this in. I currently have it working as a chat command and you dont have to even open the interface. It works but not ready to be released yet. Basically something like this. 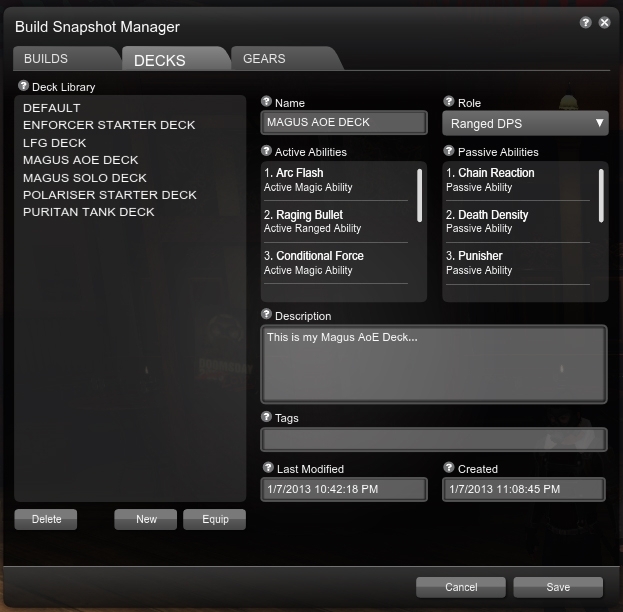 This will automatically create a deck and gear snapshot with the same name as the build and save all your abilities/gear to it. Love the mod so far. The manager tells me "Missing item 'Blood of Laceration' listed in the snapshot. When equiping gear BSM matches the items name, quality, rarity and is char bound to the item listed in the snapshot. 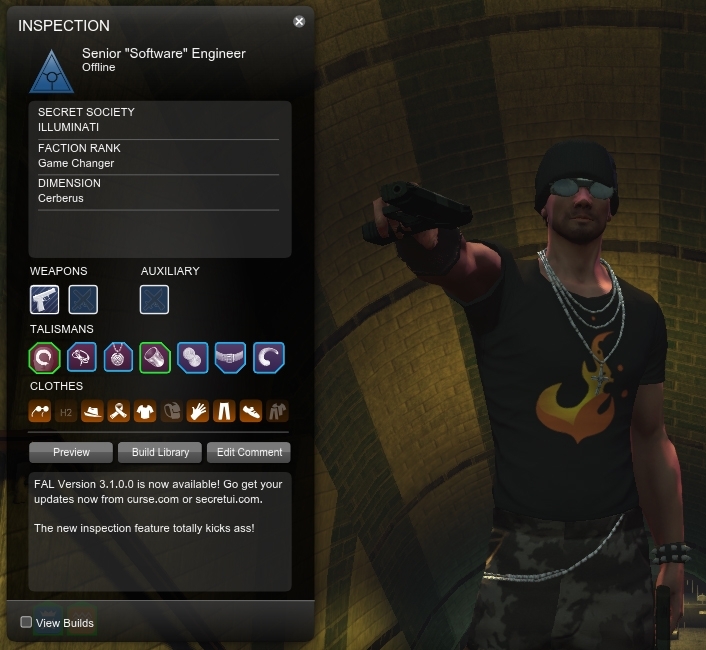 If an item can not be found matching all those values the it stops the equip process and informs the player. What might have happened was the data in the snapshot was incomplete for that item so it couldnt find a perfect match. If it happens again try manually equipping that item then click the equip button. 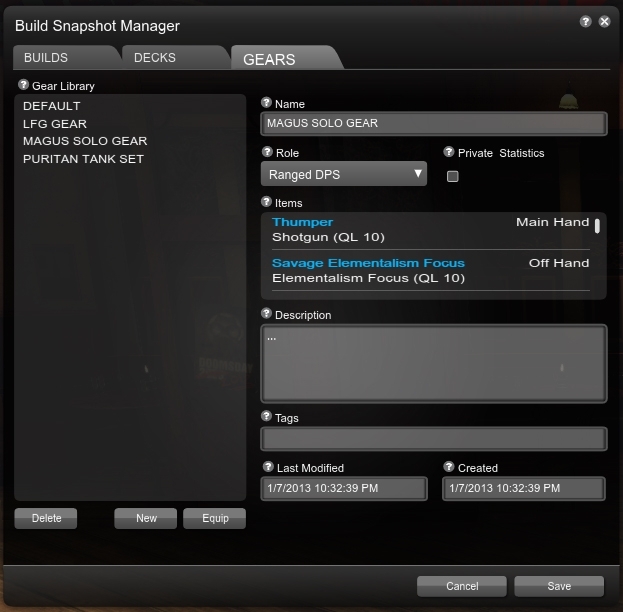 If the set equips update the snapshot by clicking the save button. For the mod to know where it got an item from in the inventory and put it back when another build that doesn't use it is loaded. The issue that makes something like this hard to do is the gear is on your character when you save the snapshot not in a bag. So it cant save this info when the snapshot is created. It could only try to remember the locations when clicking the equip button. So you would have to be completely naked with all your items in the proper bags and then equip a set with the mod. Then it would know where tht first set goes. Equiping other sets after that would work then. It would be a feature with a big learning curve tht appears to be unreliable. Last edited by Software : 01-11-2013 at 11:02 AM. A Gear set lost my head piece in that it is in my inventory in the same spot it always is and the manager tells me "Missing item 'Blood of Laceration' listed in the snapshot. 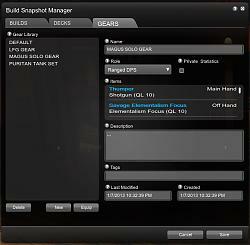 Please update your gear snapshot." I was switching between 2 gear sets back and forth to see how they loaded. It seems once it hits this issue, it stops equipping gear. It was working and then started throwing that error. I can't reproduce it and had to delete the set and recreate it for the mod to start finding that piece again. The Gear tab is truncating my set name "Heal, Leech - AR/Blood" to "Heal, Leech - AR/Blo", but the Deck and Build tab save it fine. For the mod to know where it got an item from in the inventory and put it back when another build that doesn't use it is loaded. If that spot is taken then drop it in the slot the replacement comes from. Currently, it puts it in the place of whatever item replaces it. I have 3 sets of gear: DPS, Leech Heals, and Solo and some gear is used across the builds, but some is not so I have them arranged nicely in separate bags like they would appear on the character screen (screenshot). I use my Leech neck piece for Quest and would like for it to end up back in the Leech Heal bag if I load say a DPS build rather than put it in the DPS Gear bag. Last edited by kellewic : 01-11-2013 at 07:21 AM. I'm encountering an error when trying to close the inspection window. No matter if i use it on myself or someone else, It prevents me from closing the window and I have to /reloadui in order to fix it. Window for player 'undefined' not found. Do you use Categoricals Team Window addon? What you are experiencing is caused by another addon. Last edited by Heartwire : 01-10-2013 at 04:27 PM. Very nice, thank you again. Still really appreciating this one, and your hard work. Version 1.1.0.0 has been released. All known/reported bugs have been squished. Please check BSM site for release notes. 1-i have the same passive elite problem,but if you put elite in the same slot it works good(that can be an alternative soluction at twice equip click). 2-deck manager don t save aux active ability,no problem with aux passive ability. 3-(have to try better with a gear bag option)i have a bag with all purple weapon and various bag with purple talisman,happen that in inventary i have a blue weapon(istance drop) with same name of the purple (istance drop 10.2),when i load up gear,addon go in loop for that weapon and in the end it put in the blue one. Thanks for the feedback! The same name item wont be an issue to fix. I thought I had this check in place already. I will update the code to match by name, quality, rarity and is bound. Thats a 5 min change. I will get that in tonight as well. Two quick things of note, elite passive skills don't get equipped properly, cause it comments you already have an elite passive equipped (assuming you did before hand between builds), and I locked the program into a loop by clicking 'equip' twice quickly, since that was my fix for the issue. :P Sorry to breaks stuff. Thanks for the feedback! I will get the fix in later today. As someone who's amazingly irritated at how buggy and irritating the stupid gear manager is, thank you so much from the bottom of my heart. You have no idea how much this particular add on means to me. Thank you for saving me the time to look into making one of my own. Seriously, appreciated. You're great.